Preheat oven to 350F (180C). Slice the tomatoes in half. Take a small slice off the bottom of each tomato half so they won’t roll. Place on a baking sheet, sprinkle with canola oil and season liberally. Bake for 40 to 45 minutes. 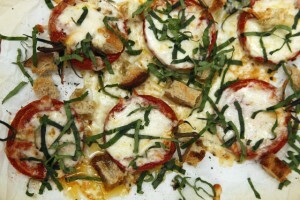 Remove from oven and sprinkle with torn bread and then the shredded cheeses. Return to oven to soften the cheese, about 15 minutes. Remove from oven, season and sprinkle with shredded basil leaves. Place potatoes in a saucepan and cover with cold salted water. Bring to the boil and simmer for 10 minutes or until tender. Drain well and set aside to cool. While the potatoes are cooking, sauté the bacon in a skillet until crisp. Drain on paper towels. Preheat the oven to 400 F (200C). 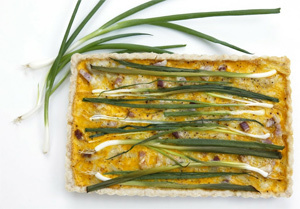 Slice the cooled potatoes into thin slices and arrange in the base of the cooked tart shell. Beat the eggs, cream, cheese, mustard and bacon in a bowl and season to taste. Arrange the spring onions on top of potatoes. Pour over the egg mixture and cook until set but still a bit wobbly, approximately 25 minutes. It will set further as it cools. Let stand for 5 minutes, then slice and serve. Makes 1 tart. Add the rhubarb, water and sugar to a medium, sauce pot and simmer over medium heat for 5 to 7 minutes. Allow to cool to room temperature and strain. Refrigerate. 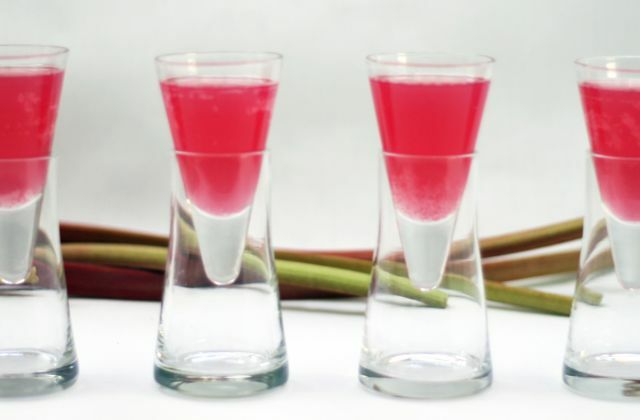 Just before serving, combine one part soda water with two parts rhubarb nectar. Makes about 1 L.